Heirs of some state residents sterilized against their will under North Carolina’s state-sanctioned eugenics program will make their case for compensation before a three-judge panel of the Court of Appeals on Monday afternoon, arguing that the legislature’s distinction between living and deceased victims for purposes of restitution violates constitutional guarantees of equal protection. 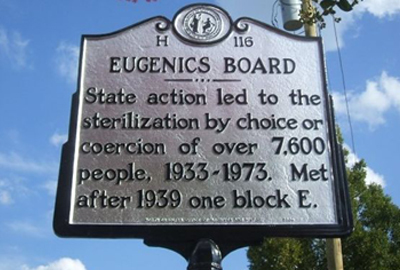 Between 1926 and 1974, North Carolina sterilized some 7,600 state residents against their will. Decades later, Gov. Mike Easley publicly apologized to the victims and their families and lawmakers began discussions about compensation for the state’s shameful program. They spoke of health funds to cover victims’ medical expenses and public education efforts to inform state schoolchildren about eugenics history, funded an interactive exhibit about the program at the N.C. Museum of History and proposed awards as high as $50,000 per victim, with no cap on a compensation fund. But by the time compensation became a reality in 2013, the state’s offering had been stripped down to a capped $10 million fund, with little else. Nearly 790 victims or their families filed claims for payment from that fund by a June 30, 2014 deadline. The Industrial Commission then reviewed the claims and found that 220 qualified for compensation. An initial payment of $20,000 was sent to them in October 2014, and a second in the amount of $15,000 went out at the beginning of November. The remaining funds are being held pending appeals. Among those denied payment are the heirs of victims otherwise qualified but who died before the June 30, 2013 cutoff date set by the General Assembly. Redmond later suffered from depression after learning what happened to her and died five years ago at 69. Redmond had a daughter before the state sterilized her, though, who went on to graduate from high school, attend college for a year and now works as a phlebotomist and has been the administrator of her mother’s estate. In papers filed with the court, lawyers for the state argue that the exclusion of heirs of victims who died before the cut-off date aligns with the purpose of the funding law, which was to compensate victims only. But as the heirs who’ve been denied compensation point out, that argument is undermined by a separate provision of the law that allows for compensation to the heirs of victims who filed a timely claim but died after the cutoff date. So, if a victim died before June 30, 2013, the families get nothing. But if a victim filed a claim by that date and then died, the families are compensated. That results in similarly-situated victims being treated differently, their attorneys argue, and bears no rational relationship to the purpose of the compensation program — which is to provide restitution to all who suffered at the hands of the state under the eugenics program. “One could indeed surmise that the apparent purpose of the living victim threshold is to limit the number of compensation recipients,” the attorneys argue in papers filed with the court. Argument in three separate cases brought by victim’s families will be heard before Judges Linda McGee, Chris Dillon and Mark Davis at the N.C. Court of Appeals on Monday, Nov. 16, 2015 at 1:00 p.m.
Is Tom Ellis, Jesse Helms’s handler, former head of the Pioneer Fund, still alive?